Lepidozamia peroffskyana is a cold, shade and drought-tolerant species from New South Wales and Queensland, Australia. Lepidozamia peroffskyana grows tall over time and and it's spineless (rare for a cycad) with leaflets that come out of the upper side of the leaf. Please click here for a larger photo of the plant pictured here. Lepidozamia peroffskyana's trunk can grow up to 2+ feet in diameter. Its crown forms from numerous leaves up to 10 feet long, each bearing about two hundred narrow, glossy, dark green arching leaflets. 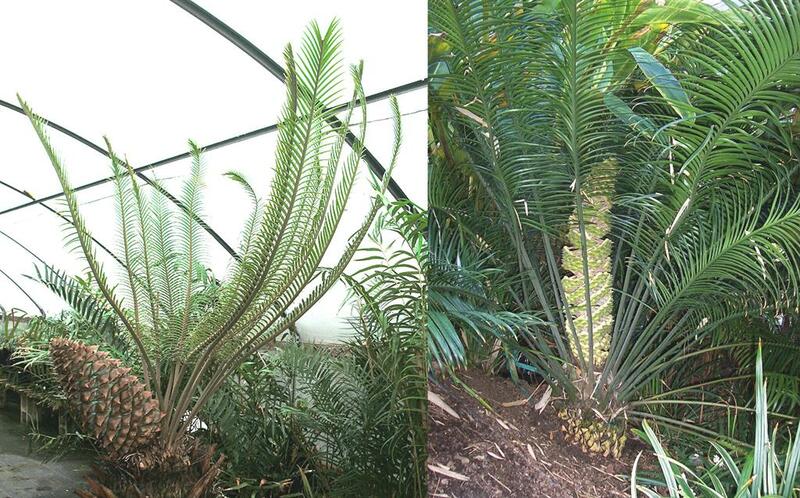 Both the female and male cones of Lepidozamia peroffskyana are some of the largest of all cycad cones, as you can see by the mature plant photo visible by clicking here. Male cones can reach 25-30 inches long and the female cones 3 feet tall, The seeds are large and numerous and have red fleshy coating.